As dazzling a Disney stage spectacle as could possibly be imagined, Aladdin is a generous slice of music theatre heaven with rainbow sprinkles on top. 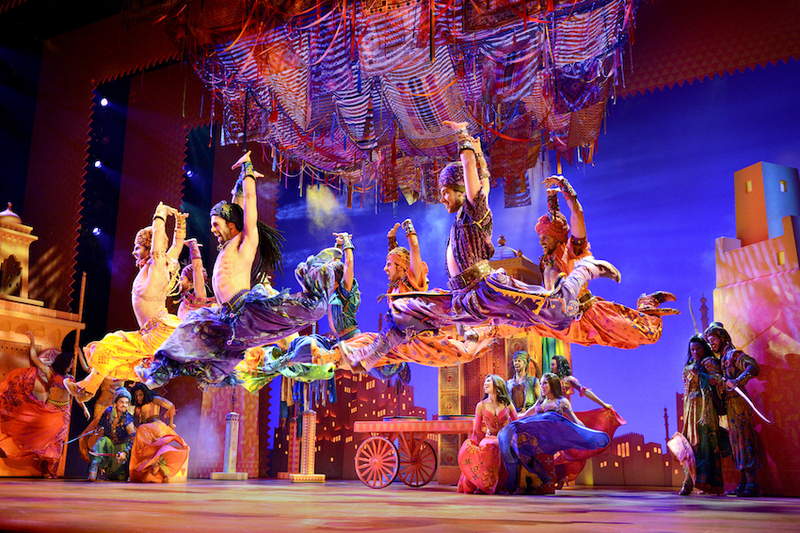 While stage musical adaptations of animated Disney movies Tarzan, The Little Mermaid and The Hunchback of Notre Dame have come and gone with little impact, Aladdin has deservedly become an international smash hit. 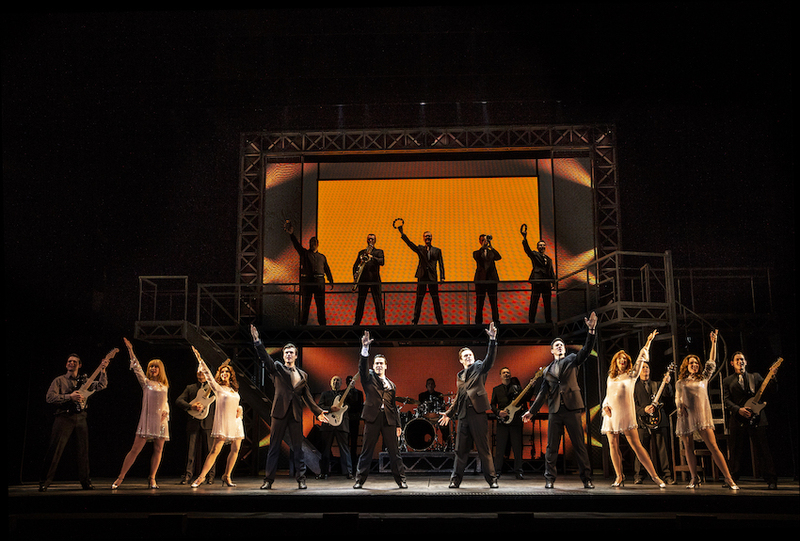 Smart, sassy and visually stunning, the musical has been fleshed out into a toe-tapping treat that happily wears it vibrant heart on its sequined sleeve. One of the most successful aspects of this stage adaptation is the way the tuneful score has been expanded so seamlessly. Songs by Alan Menken, Tim Rice and the late Howard Ashman for the 1992 movie have been complemented with new, instantly hummable compositions from Menken and book writer Chad Beguelin to create a fully integrated Broadway score. Beguelin’s book matches the zany humour of the movie, with puns, non-sequitirs and meta moments to spare. Beguelin cleverly uses the beloved Genie to introduce the show, then turns the spotlight on plucky street urchin Aladdin and restless Princess Jasmine. Aladdin and Jasmine follow the time honoured boy meets girl track, while Aladdin also enjoys a second significant relationship with Genie. Dispensing with the need for puppets or animal masks, Aladdin’s pet monkey Abu is replaced with three best friends, Babkak, Omar and Kassim, and the villainous Jafar’s squawking parrot is replaced with squawking human sidekick Iago. With four shows running concurrently in April this year, director/choreographer Casey Nicholaw has well and truly conquered Broadway. 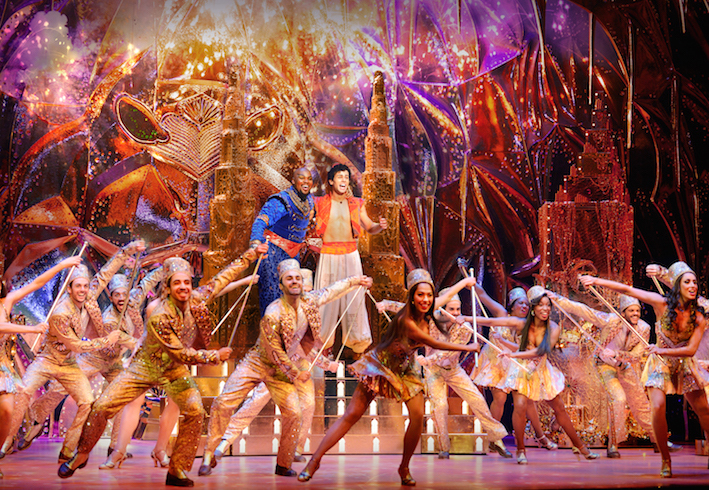 Aladdin is, however, the first of his double duty musical productions to be staged in Australia*. Nicholaw has the skill and vision to cater for today’s audiences while firmly keeping a foot in the Broadway traditions of old. Aladdin moves at breakneck pace, and yet storytelling is never less than crystal clear and human connections are paramount. 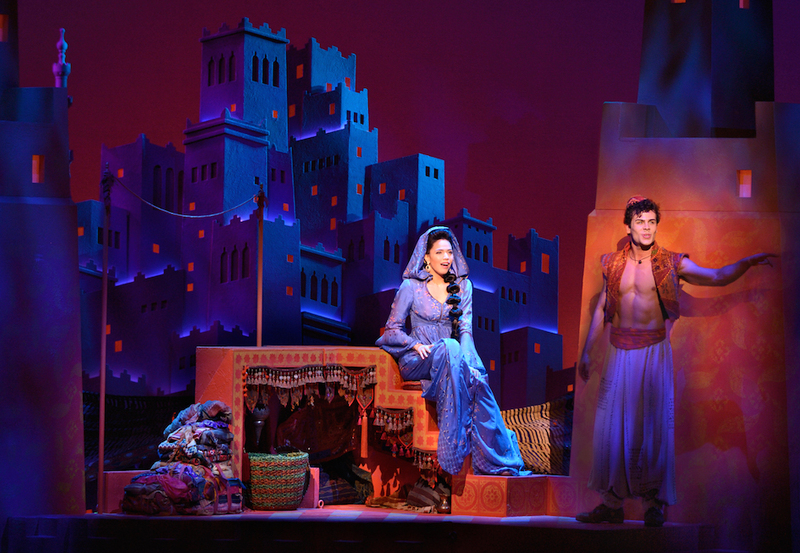 A great example of Nicholaw’s stage skill comes in lively charm song “Babkak, Omar, Aladdin, Kassim.” Nicholaw momentarily slows down the action to zoom in on Jasmine’s reaction to the market and then on Jasmine’s first meeting with Aladdin before returning the action to full pace. The added benefit of a director/choreographer is that the choreography extends to scenic movement and lighting. 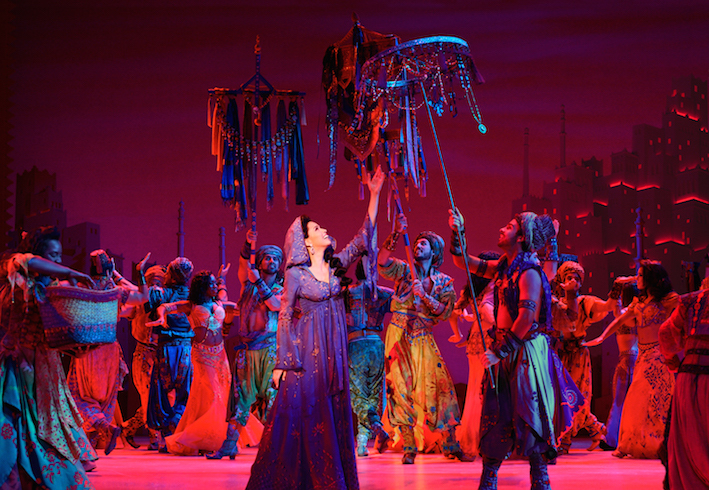 The dynamic musical numbers of Aladdin feature frequent movement of scenery and countless lighting states. The scope of Bob Crowley’s scenic design is rather epic and the artistry of its execution is often breathtaking. No photo can do full justice to the Cave of Wonders; it just has to be seen live. Likewise, the magic carpet effect of divine duet “A Whole New World” is incredible enough so as to appear to actually be magic. 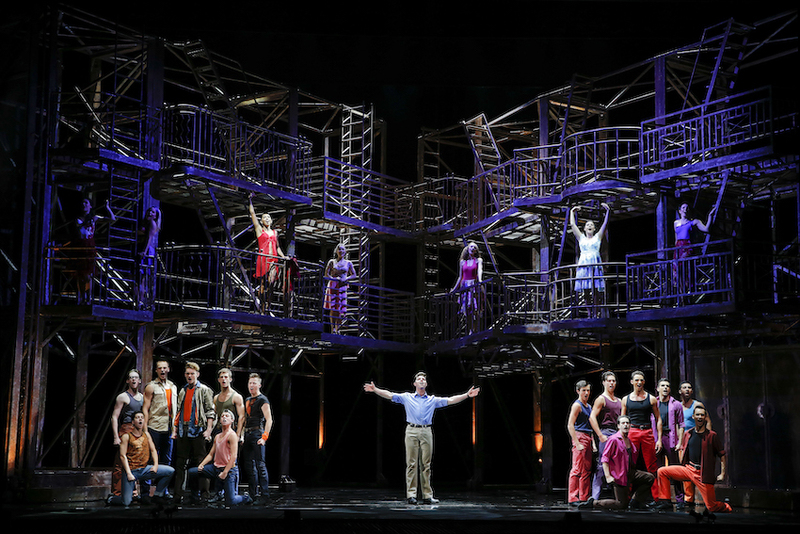 Since the 2014 Broadway opening, there seems to be little tweaks and polishes in Crowley’s design and Natasha Katz’s lighting design, making the Australian production look all the more spectacular. The programmed star cloths for the magic carpet ride are completely immersive. The midnight sky and terracotta balconies of the Capitol Theatre auditorium suit the visual appeal of the production perfectly. The stunning stage picture is completed by the truly beautiful costumes of Gregg Barnes. With a seemingly infinite budget for sequins, Barnes has crafted a cavalcade of costumes in gleaming jewel tones, pretty pastels and luxurious whites and creams. If the gold outfits of act one finale “Friend Like Me” are not eye-popping enough, the veritable fashion parade of act two opener “Prince Ali” features enough designs for an entire show. Other highlights include Jasmine’s gorgeous pale musk wedding gown, and the magic of Jafar’s double fast change at the climax. At this performance, the role of Genie was played by Gareth Jacobs. Looking just a trifle nervy as he opened the show on stage alone, Jacobs soon warmed into the sparkly camp aspects of the role. By the time Genie materialised from the lamp, Jacobs was playing at full strength, projecting the deliciously bold character to the back of the dress circle. Jacobs nails the powerhouse belt and the playful comic timing, offsetting this nicely with an endearing undercurrent of vulnerability. Die hard Disney fans will adore the breakout sequence in “Friend Like Me” when the Genie riffs snatches of ’90s Disney standards. Carrying the title role on his young shoulders, Ainsley Melham balances wholesome Disney goodness with a knowing twinkle in his eye. Buff and tousle haired, Melham sings with a pleasant light tenor. Projecting an appealing charm, Melham forges sparks of chemistry with each of his costars. Arielle Jacobs is perfectly lovely as Princess Jasmine, but it remains unclear as to why a local artist could not have played the role. The supporting cast is filled with highly experienced performers, all appearing to have an absolute ball in this Disney juggernaut. Often cast as a nice guy, Adam Murphy exhibits a nicely understated sinister flair as Jafar. Aljin Abella is brilliantly perfectly cast as sidekick Iago, reaching levels of inspired lunacy as the grinning malevolent buffoon. 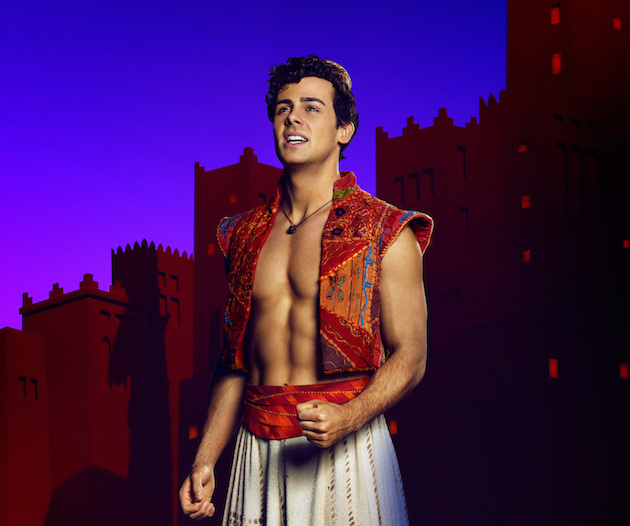 Aladdin’s sidekicks enjoy some of the choicest numbers, and the trio of actors in these roles successfully creates a set of distinct characters. Experienced leading man Adam-Jon Fiorentino captures the alpha male bravado of Kassim. Character actor Troy Sussman gleefully delivers a stream of food-related puns as Babkak. Relative newcomer Robert Tripolino makes a highly promising commercial theatre debut as nervy, fey sweetheart Omar. The hard working ensemble of triple threats makes the continuous flow of snappy vocals, intricate choreography, snappy costume changes and amusing character work seem all too easy. Take it for granted that Aladdin is unforgettable family entertainment. The additional bonus is the broad appeal for all ages. A must see. Aladdin the Musical currently plays at Capitol Theatre, Sydney and will play at Her Majesty’s Theatre, Melbourne from April 2017.